Here little pony... I want you! This would be a perfect time for trixy to say "Welcome to the heard." But, Trixie is great and powerful pony. You sir are a master! I'm trying to learn to draw ponies, and I don't wanna save the best for last, so can download this to use as a reference? Thanks a lot! I'll try my best! Trixie looks fantastic in a suit. Was there ever any doubt ? If there's anything Trixie's got, it's that certain irresistible flair of hers. screw EQD, trixies pretty damn awesome. They just did it to troll the guy who made the survey because he's a Trixie nut. The fandom has spoken. We make all the fanbrats and haters disappear. she wasn't voted the worst pony actually. the poll on EQD had other at 20% more than Trixie... but Trixie was the highest vote of all the named ponies so Seth got mad and took the poll down before it was even fully ran... Other actually won. Worst pony? The hell?! There's a LARGE number of characters worse than her. She's not even that 'evil'. Anyway, awesome drawing. 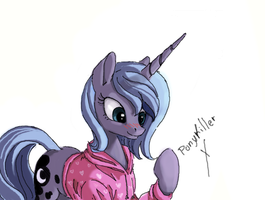 shes not the worst pony, Trixie amazing , you gota look past her snobiness to she her true beauty. Wait...the fandom picked Trixie to be a magician? No, she was voted Worst Pony on Equestria Daily's poll. Most likely to annoy poor ol' Sethisto. But it's all in good fun, not to be taken seriously. I love it! Trixie looks fantastic and I love the clothes! One of the best ponies. Worst pony my flank! I think people were just trolling Seth after he trolled everyone with that poll. Trixie!? Worst pony? What have you been smoking, man? Trixie... worst pony 2013! Such language! Although, not the best still. I don't think she's worst pone. She's great. And powerful. But really, this looks so good, the tuxedo sure suits her.